How do I become a certified drone pilot? 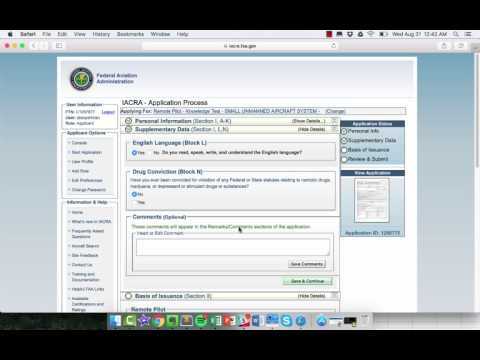 How can I prepare for the Part 107 written drone test? How can you schedule and take your FAA aeronautical knowledge drone test? What if I already have an FAA Section 333 Exemption? Do I need to be a certified drone pilot? What kind of individuals / companies are getting certified? Do I need to have a (manned aircraft) pilot license? What if I already have a manned aircraft pilot license? How much does it cost to get a drone pilot certificate? Completing the FAA’s drone certification process can help you start piloting commercial drone flights for work or business. You’ll need an FAA-issued Part 107 Certificate, which covers the majority of low-risk, commercial sUAS flight operations. This guide covers the basics of how to become a commercially certified drone pilot in the U.S. and how you can prepare for the operating provisions of Part 107. → How do I become a certified drone pilot? → How can I prepare for the Part 107 written drone test? → When will the Part 107 written drone test be available to take? → What if I have (or am waiting for) an FAA Section 333 Exemption? → Do I need to be a certified drone pilot? → What kind of companies are getting certified? → Do I need to have a (manned aircraft) pilot license? → What if I already have a manned aircraft pilot license? → Do I have to pass a medical exam? → How much does it cost to get a drone pilot certificate? → How long does it take to get certified? Pass an initial aeronautical knowledge test at one of around 700 FAA-approved knowledge testing centers across the United States. That’s what our Part 107 training course prepares you for. Obtain a Remote Pilot Certificate with a small UAS rating (like existing pilot airman certificates, never expires). Report an accident to the FAA within 10 days of any operation that results in injury or property damage over $500. Those represent just a few details about Part 107. Want to learn more? You can read an overview of the ruling here, or you can download the full 624-page ruling here. For those who need to operate outside the flight and mission parameters of Part 107, you’ll need to gain additional permission from the FAA through a waiver process. Things like flying at night, operating beyond visual-line-of-sight (BVLOS), etc. Check out Drone Pilot Ground School. It’s an at-home Part 107 test prep and commercial drone training course for those of you looking to become certified under Part 107. Yes we’re biased, because we built it, but we’re really proud of the training content and wholeheartedly believe we offer the best training product (and company support) of anyone else in the drone industry. Here are some reviews from the 15,000+ students who’ve gone through our online course. You can learn more about our full training curriculum and methodology here. And here are some Drone Pilot Ground School discount codes. The FAA Aeronautical Knowledge Test (AKT) is administered on a rolling basis at roughly 700 testing facilities all over the U.S. I usually tell our students to schedule the test at least a week ahead of when you need to take it. Most of the testing centers are relatively small, and while demand isn’t overwhelming, it’s the kind of thing you need to schedule ahead of time. It’s an objective, multiple-choice type test. There are 60 questions, with three single responses (A, B, and C) per question. Each test question is independent of other questions; therefore, a correct response to one does not depend upon, or influence, the correct response to another. Some questions may require visual references, like airspace maps or charts. The minimum passing score is 70% (meaning, you’ll need to get at least 42 questions right). You’re allowed two hours to complete the test. When you’re ready to take your test, here’s how you can schedule it. First, take a look at the testing locations and locate the state and city where you want to test. I’d recommend calling to schedule your test appointment at least a week ahead of when you want to take it. Most of the testing centers are relatively small, and while demand isn’t overwhelming, it’s the kind of thing you need to schedule ahead of time. When you’re ready to take your test, contact CATS at 1-844-704-1487 (or http://catstest.com/) to schedule your testing appointment. You can read the FAA’s full position on Page 81 of the Part 107 ruling here. Basically, if you already have a Section 333 Exemption, you can continue to operate under its provisions throughout the 24-month licensing window. You can choose to go through Part 107 separately if you’d like, which depending on what kind of operations you’re doing, will offer much less strict provisions. Do I really need to be a certified drone pilot? If you’re just planning to fly your drone / UAV recreationally, then no. You don’t need Part 107, the Section 333 exemption or any other kind of UAV certification. You’ll just need to abide by standard safety guidelines as regulated per the FAA. We recommend consulting Know Before You Fly for recreational sUAS guidelines. Note: If you’re flying a drone that weighs over .55 lbs / 250g, you’ll need to register it with the FAA, even if you’re just flying recreationally. This went into effect on December 21st, 2015. To operate commercially though, where “commercial” describes any kind of flight operation that can be tied to economic benefit, the FAA requires you to get certified. So Part 107 explicitly regulates commercial sUAS activities. Fly under the small UAS rule – follow all rules under 14 CFR Part 107, including aircraft and pilot requirements. Obtain a blanket public Certificate of Waiver or Authorization (COA) – permits nationwide flights in Class G airspace at or below 400 feet, self-certification of the UAS pilot, and the option to obtain emergency COAs (e-COAs) under special circumstances. Of course, just because you’re certified doesn’t make you a strong drone pilot. You’ll need to master basic flight proficiency. You’ll need a strong command of the sUAS landscape, your hardware, your software and what can go wrong. And of course, to earn money as a professional drone pilot, you’ll need a strong business plan. The most common commercial application is real estate and film / cinematography. California and Florida are the two states with the most number of certified drone pilots. A majority of certification holders indicate that the pilot is operating a DJI product. Other commercial applications include precision agriculture and the inspection/monitoring of utility and energy infrastructure. We get asked this one a lot! Under a traditional Section 333 Exemption, yes. Let’s dive into this a bit. The licensed pilot can be either a company employee or independent contractor, as long as he or she satisfies the qualifications articulated in the Section 333 Exemption guidelines. So what does being a licensed pilot mean? It means you either have, at minimum, a sport or recreational pilot license. You do not need to have a private pilot’s license, but if you already do, that satisfies the requirement. You could also have an airline transport or commercial license, but for most of you that doesn’t apply unless you already have a career in aviation. Under this grant of exemption, a PIC must hold either an airline transport, commercial, private, recreational, or sport pilot certificate. The PIC must also hold a current FAA airman medical certificate or a valid U.S. driver’s license issued by a state, the District of Columbia, Puerto Rico, a territory, a possession, or the Federal government. The PIC must also meet the flight review requirements specified in 14 CFR § 61.56 in an aircraft in which the PIC is rated on his or her pilot certificate. Under Part 107, a traditional Part 61 (manned aircraft) pilot license is not required. Then you don’t need to go through our training course. You can complete a (free) online training course called “Part 107 small Unmanned Aircraft Systems (sUAS) ALC-451” available on the FAA FAASTeam website. You’d then complete FAA Form 8710-13 (FAA Airman Certificate and/or Rating Application for a remote pilot certificate), validate your applicant identity, and make an in-person appointment with your local FSDO, an FAA-designated pilot examiner (DPE), an airman certification representative (ACR), or an FAA-certificated flight instructor (CFI) to sign your form. No, you do not. There is no medical exam required to operate a drone under a Section 333 Exemption or Part 107. A government issued I.D like a driver’s license or Passport can substitute for a medical flight physical. The FAA only charges $5 to get a commercial sUAS registration number. Under Part 107, drone pilots are required to pass an FAA Aeronautical Knowledge exam. Traditionally, this kind of test has been administered through one of two companies, Computer Assisted Testing Service (CATS), and PSI / LaserGrade Computer Testing. There are about 700 FAA-approved knowledge testing centers across the United States. The cost to take the aeronautical knowledge exam is $150 at a licensed testing center. Other than that, there are no hard costs absolutely required to gain your drone pilot certificate from the FAA. Of course, if you’re building a drone business, you may want to look into drone liability insurance, where an annual $1 million liability insurance policy might run you $500-$800/year. 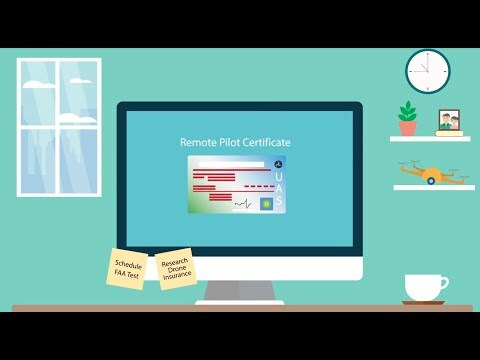 After you pass your Aeronautical Knowledge Exam, you’ll need to wait up to 48 hours to apply for your Remote Pilot Certificate using the FAA’s online IACRA system. I shot a short video of my experience doing that here. Pretty straightforward. After you send in your application, you’ll go through automatic TSA security vetting, and then assuming you pass that, you’ll receive a temporary electronic Remote Pilot Certificate. The FAA anticipates that, while it may take the FAA 6 to 8 weeks to issue a permanent Remote Pilot Certificate via snail mail, a temporary remote pilot certificate can be issued in about 10 business days. The temporary Remote Pilot Certificate will allow the certificate holder to exercise all the privileges of the certificate, thus significantly reducing the waiting period prior to being able to operate as a remote pilot in command under part 107.